2/27/18 Just did an awesome recording session with the Osmond Chapman Orchestra featuring David Osmond, Caleb Chapmans's amazing band, and Rashawn Ross of the Dave Matthews Band. 2/9/18 Santa Sussana High School has invited me as a special quest for their Swing Night along with the supremely talented Steven Spencer from Post Modern Jukebox. 1/11/18 : Iggy T's new Video is out. Ive been involved with these beautiful folks in a really fun band and they're on fire. An entire record and videos in a year. They're prolific and motivated and I'm honored to be involved. This is our first Video release with a tune called "all caught up"
BIG BAD Voodoo Daddy releases new record!! Big Bad Voodoo Daddy presents Louie, Louie, Louie, the band's eleventh studio album and a salute to the music of Louis Armstrong, Louis Jordan and Louis Prima. Louie, Louie, Louie reveals the evolution of swing, jazz and popular music through the songs and personalities of these three giants of American culture. With a blend of greatest hits and essential works, the listener is transported from the earliest days of New Orleans jazz and ragtime to the birth of R&B and rock and roll. These remarkable artists revolutionized American music and popular culture and set new standards for what great entertainment and artistic expression could be. Their influence on Big Bad Voodoo Daddy is profound and if you enjoy the band, they are among the chief reasons why. 'Louie' CDs, Vinyl, T-shirt and Poster available in the STORE. Downloads at Amazon and on iTunes. Big Bad Voodoo Daddy is one of the most dynamic little big bands in the land. This 11th album is proof positive of that claim. Formed 24 years ago in Southern California they never fail to slay an audience. This tribute to Louie Armstrong, Louie Prima and Louie Jordan, the most important Louies in swing and jazz, the 13 songs here are all classic and given a classic turn by the fellas, all original members. Louie Armstrong was the first of the three to impact American culture and the first we hear from, literally. An old transcript has Pops introduce the song. The band then tears into it with fervor. Trumpeter Glen ‘The Kid’ Marhevka picks up where Louie Armstrong lets off. That’s the story of this record: seven adoring musicians with chops to spare. Louie #1 is also represented by the classic “Basin Street Blues,” played by pianist Joshua Levey, with drumming by Kurt Sodergren, before trumpet and horns break in. “Struttin With Some Barbecue” and “When the Saints Go Marching In” are Armstrong staples also here. Next Up are Louie Prima’s “Oh, Marie,” “Whistle Stop,” Five Months, Two Weeks, Two Days,” and a fantastic take on his signature tune, “Jump, Jive and Wail.” Plenty wailing going on, especially Karl Hunter’s tenor. The final Louie in the trilogy is the most prolific. Louis Jordan owned the late 1940s with the classics represented here. “Is You Is Or Is You Ain’t My Baby,” played very close to the original, and “Jack, You’re Dead,” sees the horns cookin’. “Choo Choo Boogie” is taken percussively down the track, with everybody shining. The sly “Knock Me A Kiss” is given a superb finger-snapping take and the last Jordan in the set, “Ain’t Nobody Here But Us Chickens,” one of the most recognizable of Louie #3’s tunes, gets piano and horns riled up behind some lively vocals. This is a treat for two reasons: The three Louies and Big Bad Voodoo Daddy wailing in tribute. This one’s a blast. 5 of 5 stars. 9/16/16 TD Lind is a serious force to be reckoned with. His soulful and powerful voice & impeccable time makes him one of my favorite musicians to play with ever. Check out TD Lind's new Video "Bow Down" !! I did the horns on this and a bunch of other great tracks on Tim's Record. This video came out great and features the political cartooning of Walt Taylor. I have a cameo of sorts as an animated Bill Clinton plays my saxophone solo on an animated sax! Monday February 8th at 7pm, Ojai resident, Karl Hunter of the Grammy nominated, platinum selling band, Big Bad Voodoo Daddy, will be giving a special woodwind clinic/masterclass at the Matilija Junior High School auditorium in Ojai. This is a special event that's open to the public and especially for any local band students. If you play, or want to play, Saxophone, Clarinet or Flute you don't want to miss this free clinic. Karl will cover techniques for improving tone production, finger dexterity, articulation, as they apply to all of the woodwind instruments, how and what to practice, how to improvise, and what it's like to be a working touring musician for the last two decades with one of the most popular "horn bands" around. I'm returning to Squashed Grapes with cadre of heavyweights. Hans Ottsen, Tyler Hammond, Jeff Falkner and from L.A, our friend Sabine, will join on Piano. Karl to return To Squashed Grapes with Nee's Bees MAy 2nd. Karl to play Clinc and multiple concerts With the Denver soundhouse© and Kent Denver Bands! Come out to Squashed Grapes on April 8th, I'm playing with nee's bees! Big Bad Voodoo Daddy is playing a benefit for the La Cumbre Jumior High School performing arts theatre on Saturday. It's also a tribute to Ike Jenkins which I am more then honored to be able to participate in. He's absolutely the reason I'm a musician! Thanks Ike!!! “You can’t really talk about music education in Santa Barbara without talking about Ike Jenkins,” said Karl Hunter, and we couldn’t agree more. Alongside his Big Bad Voodoo Daddy bandmate Dirk Shumaker, Hunter is just one of the many (many, many) to have crossed the threshold of Jenkins’s classroom over the last four decades. “If it wasn’t for Ike, I never would have started playing music,” he said. This Saturday, Hunter, Shumaker, and the rest of the Voodoo Daddy crew will headline a benefit concert for the La Cumbre Junior High School Performing Arts program at the school’s newly erected Performing Arts Center, which currently stands as the only public performance space on the Westside. Almost as importantly, though, the night is being billed as a tribute to Ike Jenkins, who this year celebrates 45 years of teaching music to the students of Santa Barbara. Since coming to La Cumbre Junior High in 1971, Jenkins has taught classes, conducted big bands, and imparted his love of music to young instrumentalists throughout the 805. He taught La Cumbre, then Dos Pueblos and Santa Barbara high schools, and he currently serves as the musical director for the Monday Madness Big Band at SBCC. He’s also as invested as ever in the state of music education in our public schools. While we can easily rattle off a long list of Jenkins’s accolades, we thought it best if you heard the word from those who witnessed the man in action. Below, Hunter and Shumaker reflect on the lifelong impact and friendship of Ike Jenkins. “I graduated from Dos Pueblos in 1989, and I had Ike for my last three years there. When I started, I was playing clarinet. I was terrible, and I didn’t care. Ike came in [to teach] the second half of that first semester, and once I heard his band and saw how he taught, I really got interested in music. After a year, maybe a year and half, I knew that I wanted to be a professional musician. It was that quick. “I was in junior high when I met Ike. It was 1978, and he was the music teacher at La Cumbre. I played trombone and was in the concert band and the jazz band, and he was the conductor. Coming from elementary school, where you just had one teacher, to La Cumbre, going into the band room and having him as the director was just spectacular. He had posters up on the wall and a record player. We’d listen to music. It was just amazing. Big Bad Voodoo Daddy headlines a benefit concert for the La Cumbre Junior High School Performing Arts program on Saturday, March 7, at 7:30 p.m. at the La Cumbre Junior High School Performing Arts Center (2255 Modoc Rd.). For tickets and info, call (805) 963-0761or visit lobero.com. I'm really excited about the upcoming Peeks Jazz Festival on February 26th-28th at Utah Valley University. I'm a guest artist and clinician and I'm going to have some great company. Tom "Bones" Malone, Brian Lynch, Will Kennedy, Dave Pietro, & Jerry Cortez. 4/21/14 -On May 3rd I'll be the guest artist for Moorpark College's first Annual Jazz Day. I'll be playing with the Middle School, High School and Moorpark College Band. I'm excited to get out to the schools and share my love of music especially Jazz. Hope you can join the party! Yamaha Artist Services Indianapolis announced that the horn section of the legendary Big Bad Voodoo Daddy band has joined the Yamaha Artist family. GRAMMY Award® nominated swing band Big Bad Voodoo Daddy has sold millions of records, and their music has appeared in hundreds of movies and television shows since the band hit the scene in 1993. Their classic jazz sound has captured audiences for more than twenty years and continues to mesmerize new listeners. 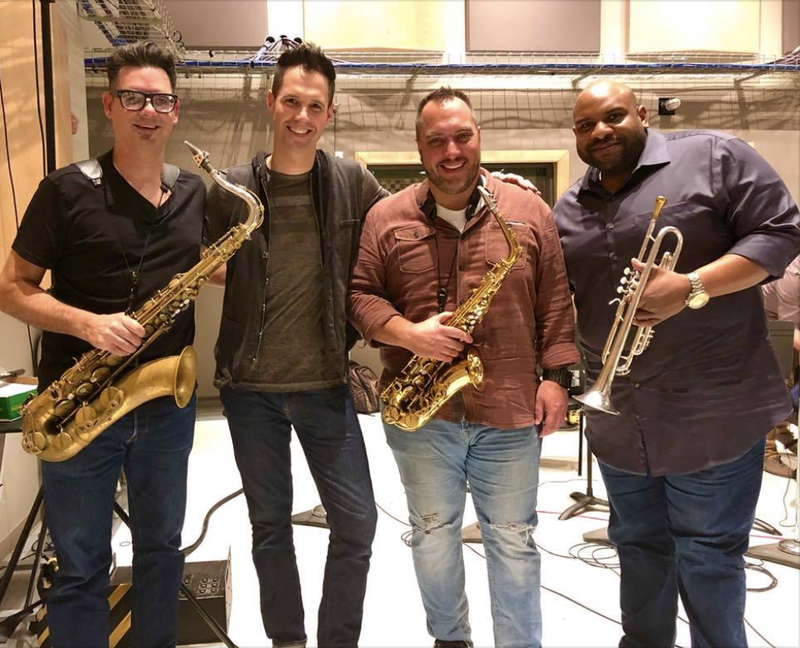 The horn section consists of Karl Hunter (YTS-82ZIIU Saxophone), Andy Rowley (YBS-62 Saxophone), Glen Marhevka (YTR-8310Z Trumpet), Anthony Bonsera (YTR-8335LA Trumpet), and Alex Henderson (YSL-891Z Trombone). 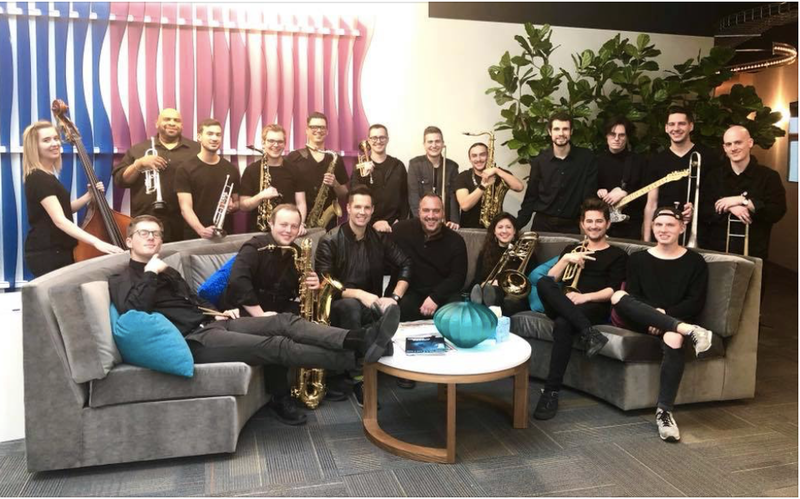 "From the moment we started playing Yamaha horns, we noticed that we blended together beautifully and it was easy to play in tune as a section," said the band's horn section in a statement. "We enjoy working with Yamaha through clinics and keeping the world inspired with our Yamaha horns." The band began by playing clubs and lounges in southern California, offering a sound that transported the listener to the 1940s and 1950s. After their big break came with the hit songs "You & Me & the Bottle Makes 3 Tonight (Baby)" and "Go Daddy-O," the group signed to a major label and their career took off. To support the band's tenth studio album, It Feels Like Christmas Time, released in 2013, Big Bad Voodoo Daddy toured the United States and celebrated their 20-year anniversary. The holiday album follows their 2012 release, Rattle Them Bones, which marked the group's return to the top of the Billboard Charts. Even with their continued success, the band maintains a strong commitment to music education by conducting clinics across the country. "Glen, Anthony, Karl, Andy, and Alex add a hip element to our artist family," said John Wittmann, director, artist relations and education, Yamaha Artist Services Indianapolis. "Their experience, legendary talent, and dedication to music will help excite the next generation of horn players." The "Organ"ic Quartet is Ready! So, the first KH quartet,back in November, was in the fusion vane. We played a bunch of Herbie Hancock tunes and went ballistic. It was a wild ride and a whole lot of fun! Rufus Philpot, Aaron McLendon, and Andy Langham killed it. It was amazing! I'm still listening to the recordings! The second installment of the Karl Hunter Quartet is going to explore another one of my favorite sub-genres of jazz, the organ trio/quartet. One of my favorite musicians is Jimmy Smith. His playing is rooted in the blues. But there is something about his phrasing on the B3 organ that is so unique. I've been listening to Jimmy a lot over the years and he did a lot if great records with amazing tenor players. We had a rehearsal last night for Saturdays "organ"ic quartet gig and it went great. Jimmy Calire brought a bunch of his tunes and they are really great. Plus, I brought in some of my favorite Jimmy Smith classics. I brought all my horns with me, soprano, alto, tenor, Bari and I couldn't put my tenor down. It just sounds so good in that organ setting. I'm really excited about Saturday's gig. It's going to be great! Speaking of great, Mario Calire, Jimmy's son, and an amazingly tasty drummer, sounds great, and always instinctively gets what each tune requires. He always keeps musicality at the forefront. His grooves always feel so good and make it so easy to play over. It's no wonder that Mario was picked up to play with the Wallflowers at such a young age. His knowledge of the proper styles and grooves in jazz and Latin music is amazing and I look forward to learning a lot from him. Hans Ottsen is also amazing and such a intuitive musician. Guitar has so many functions in Jazz and Hans knows precisely where and how to play each functionality. It's a delicate balance between showcasing your own personal voice and serving the music and I'm learning a lot from Hans' playing as he balances both beautifully. I love how his playing is both cerebral and inventive, and at the same time he'll throw in that perfect phrase that fits the groove and genre to a tee. A perfect balance of paying respect and moving jazz forward. When I moved back into the "805" about 5 years ago, I settled in Ojai. And without fail, when I met someone, and mentioned that I was a musician, the response was always, "Oh, you must know Jimmy Calire." Well, I didn't at first, but I'm so glad I do now. Jimmy has been in the Ojai area for many years, he originally hails from Buffalo NY and came out to our sunny shores when he played with the band America. I always liked when I heard an America song. I knew they had a few hits etc. Big Bad Voodoo Daddy shared a bill with America several years ago, and while sitting on the side of the stage I was blown away by how many hits they had. One amazing hit after another. There wasn't one song in their entire set that I didn't know well. So I finally met Jimmy and got to hear his B3 organ playing and was blown away. A lot of piano players dabble in organ, but Jimmy is the real deal and makes it sing. He has tons of experience and it shows when he plays. He has the knowledge of harmony and passing chords that you don't just learn playing real-book tunes in the practice room. You can tell Jimmy learned his craft the right way, on the bandstand. I'm feeling so much gratitude to be able to play jazz with so many great players lately. Jazz is a language, and there is no better way to become more articulate then to immerse yourself in the conversation. If you are free this Saturday and would like to hear a few things we have to say musically, come down to Squashed Grapes in Ventura. It's on Main Street, a half block east of seaward. The experience there is amazing and the folks that work there seriously could not be any nicer or supportive. It really is a Ventura treasure. We start at 7:00. I hope you can join us. On March 22nd 2014 the Karl Hunter quartet returns with an Organ quartet line up! I've always been obsessed with the sound of a Hammond B3 Organ. It's a powerful and versatile instrument that can wear so many shoes in a combo setting. There's something extra special about the groove that's created when the harmonic rhythmic "comping" is combined with bass lines by the same player. I've always loved the sound of Jimmy Smith, Joey DeFrancesco, Lonnie Smith, Jack McDuff, Jimmy McGriff and the new wave, John Medeski and Robert Walters. Like guitar there seems to be an inexhaustible energy in the organs sound that when used correctly can span from soft, delicate and beautiful to intense, aggressive and piercing. The "Organ"ic quartets B3 sound will emanate from the very capable, venerable B3 master Jimmy Clarie - Jimmy is a esteemed fixture in the Southern California Jazz scene. He is most known for his touring with the band and prolific hit maker "America"
Jimmy's Son Mario Clarie is a chip off the ol' block also an amazing musician with his own impressive résumé. Mario was the original and current drummer for the Wallflowers and played for many years with the hip-hop Latin power house Ozomatli. Hans Ottsen is a Ventura jazz Guitar Landmark. And a brilliant musician. I love his playing and musicality and is a perfect fit for this ol' school Organ quartet line up. I will be featured with all three Jazz bands. It's at the newly remodeled Garvin Theater on the Santa Barbara City College Campus. Hope to see you there! Longtime fans of the group’s neo-crooner jazz sound, as well as anybody who digs solidly crafted and always swinging traditional jazz and pop, should find much to enjoy here. 9/4/12 "Rattle them Bones" BBVD's latest album debuts #1 on iTunes Jazz!